She's got a gorgeous figure, great complexion and loads of energy, yet she eats all day. What's the 'Everyday Italian' and 'Giada at Home' star's secret? She’s got a gorgeous figure, great complexion and loads of energy, yet she eats all day. What’s the Everyday Italian and Giada at Home star’s secret? “I eat a little bit of everything and not a lot of anything,” explains the Food Network chef, who says her weight is the number one thing her fans ask about. 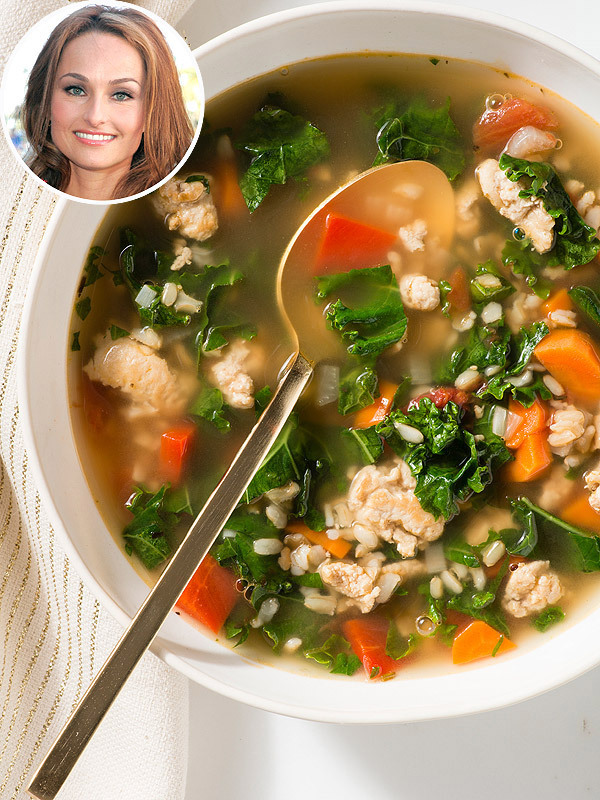 One of the stay-trim tricks that she reveals in her new book, Giada’s Feel Good Food: My Healthy Recipes and Secrets: When she orders an entrée in a restaurant, she asks for half of the portion on her plate and the remainder in a take-home container. De Laurentiis also ‘fesses up plenty of non-pasta indulgences, including a hearty turkey soup made with Thanksgiving leftovers. “I absolutely love it,” she says. “It just makes me happy and is one of those dishes I crave when it is cool outside.” Kale, brown rice and olive oil make this a filling, guilt-free bowl.